Inder Loves Folk Art: Some special things for a special baby. Some special things for a special baby. Okay, full disclosure: I don't usually make baby quilts. In fact, the only babies I've made quilts for until now were blood relatives. And I haven't even made a quilt for Maggie yet! When my friends have new babies, I am more likely to whip up some little baby pants for them. Quilts are a lot of work, and I figure most of my friends have a grandma, auntie, or other friend quilting for them. 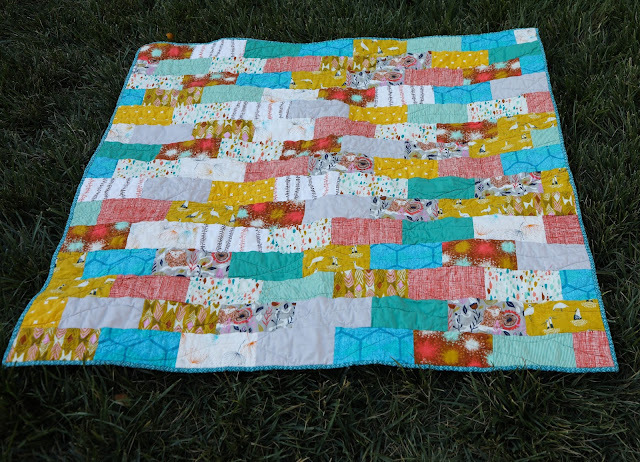 But I was inspired to make a quilt for a very special little guy. My friend's (33 year old) husband was diagnosed with cancer and went through chemotherapy earlier this year. She cared for him while pregnant with their first child, and under a lot of stress. He's out of chemo now and doing great, with a pretty encouraging prognosis. But then my friend was diagnosed with preeclampsia and her baby with IUGR, and she had to deliver her baby boy at 30 weeks! Ugh! So he spent weeks in the NICU. He's home now, but still only four and a half pounds, and it has been quite a road! So I did more than just sew Avery's name on a banner. But I did that too. 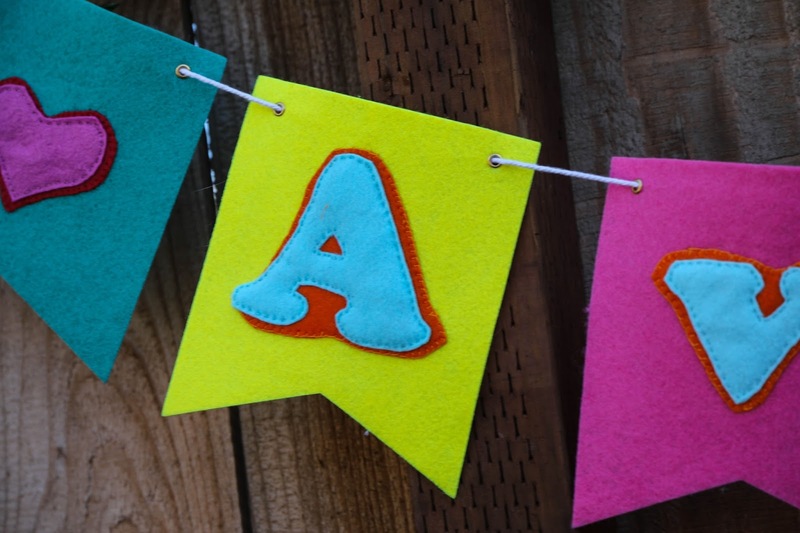 By hand, with two layers of felt for each letter. The kids helped me with every step of these projects. After I cut out the letters and their "shadows," Joe pinned the pieces onto the banner and happily displayed the banner. "Send that photo to Avery's mom!" he said. 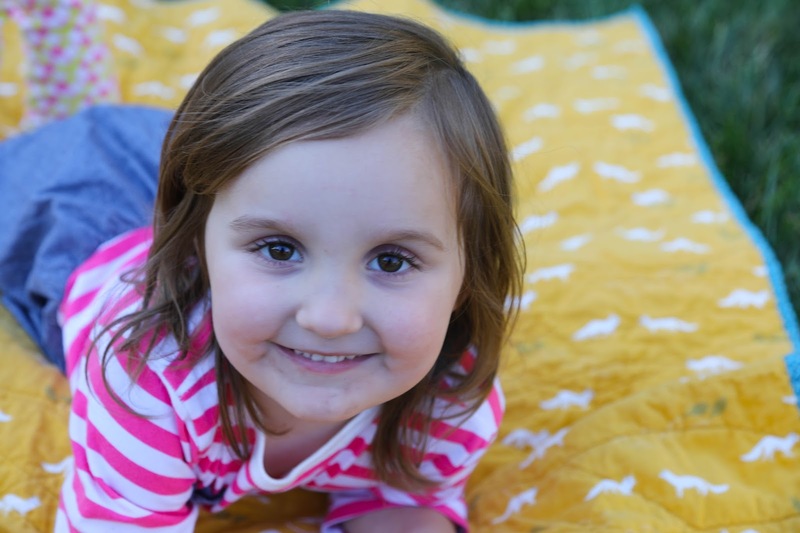 I didn't, because I wanted the banner to be a surprise, but I told her the story, and she was delighted to be called "Avery's Mom." Some of you may remember when being called someone's "wife" or "mother" was unfamiliar and different - I do. That's where Avery's mom is these days, but I expect she'll get used to it soon enough. Each of the letters on the banner, plus the heart and the star, were sewn on by hand, first with a blanket stitch, and then with a running stitch. The end result is very puffy and 3-D, and I'm happy with it. Yeah, I probably could have found an easier way to do this banner, but it was enjoyable work. The back of the quilt is really gorgeous (and conveniently colored) Dear Stella Arctic Foxes cotton flannel, which is super soft and nice to work with. And FOXES. I made a little label with baby's first and middle name and birthdate. I noticed that my friend felt pretty negatively about her baby's birthdate, because he was so premature. But he shares a birthday with my best friend of nearly 30 years, and I feel that THIS IS A GOOD DAY TO BE BORN. Every birthday is a miracle. 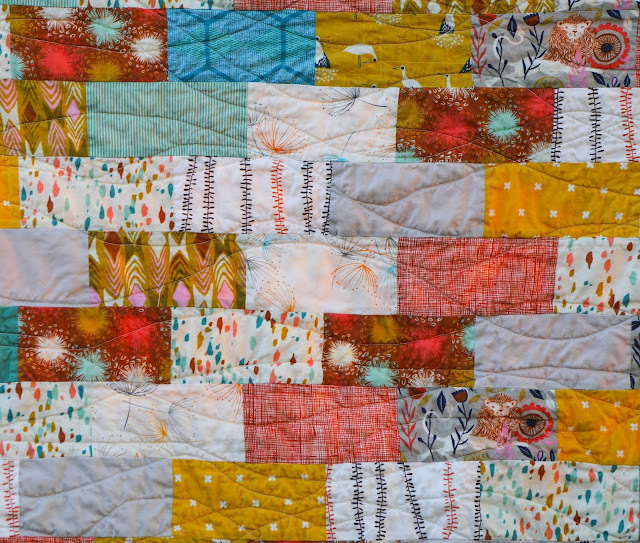 The fabrics in this quilt came mostly from my stash. They are *mostly* Cotton and Steel, but there are solids and other prints mixed in as well. Not being a designer quilting fabric expert, the only one I can name is the Lotta Jansdotter "Ranka" fabric with the vertical "vines" in orange and dark brown, which has been marinating in my stash for years. When I decided to make a baby quilt, I immediately went to my Facebook sewing friends group, a tight-knit group of friends who met over breastfeeding our babies, believe it or not! I've "known" these ladies for 7+ years now, although I've only met some of them in person. 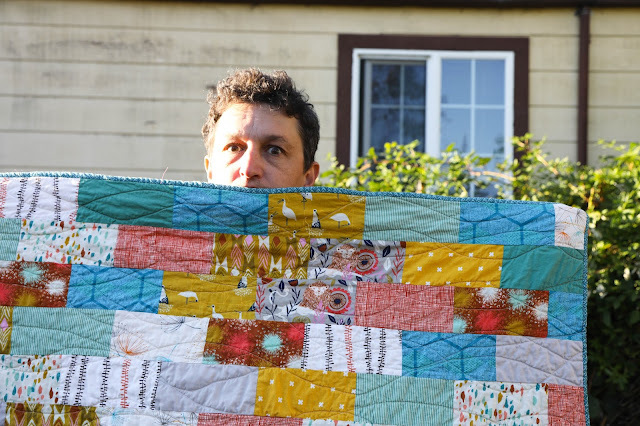 My friend Mahriam, an incredible quilter (blog and insta), helped me choose fabrics for this quilt. Poor thing was TRYING to hang out with her kids and have a normal day, but I kept texting her pics of fabrics! She was such a good sport, though, and really helped me curate fabrics. My friend Kelly helped a bit too. At one point she turned one of my photos into black and white, and I thought something was wrong with my Facebook Messenger. But no, it turned out this was a form of quilting magic, and she was "checking for values." Magic, I tell you! Then my sensible friends, knowing both my (lack of) quilt skills and my tendency to be overambitious, wisely advised me to go with a nice and simple quilt. Mahriam did a tutorial about a brick pieced shower curtain she made a while back and suggested I go with that. Ultimately, this simple style showcased the prints I chose, and it meant no matching of corners, making for a really easy to piece quilt! Once again, I engaged child labor in the arranging of fabrics. Actually, the kids arranged the pieces magnificently, with no two bricks of the same fabric touching, and then I got the strips mixed up and could never replicate what they had done, so the final arrangement is not quite as good as what the children came up with. 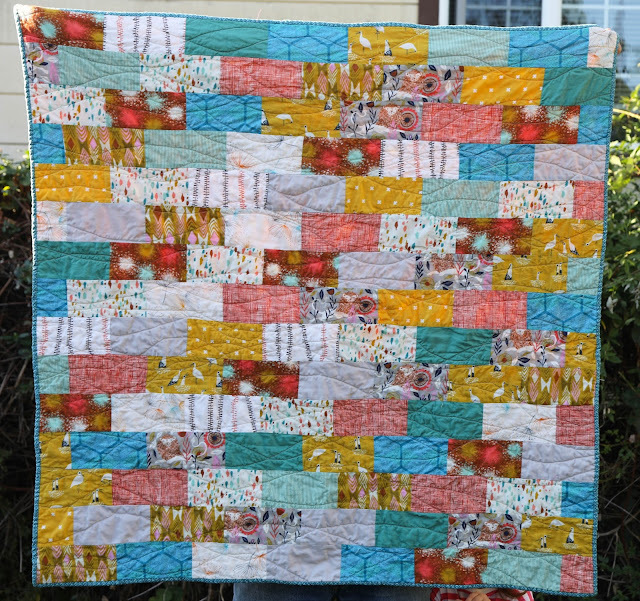 I agonized a bit over how I should quilt over the brick piecing. Horizontal lines seemed too boring. Diagonal lines would require a lot of marking. I did some internet searching and found some examples of wavy lines, which I really liked, but I had never quilted with any kind of curved lines before! Well, I decided to try it anyway, and I'm happy to say, it was SO easy and I am really happy with the final results! 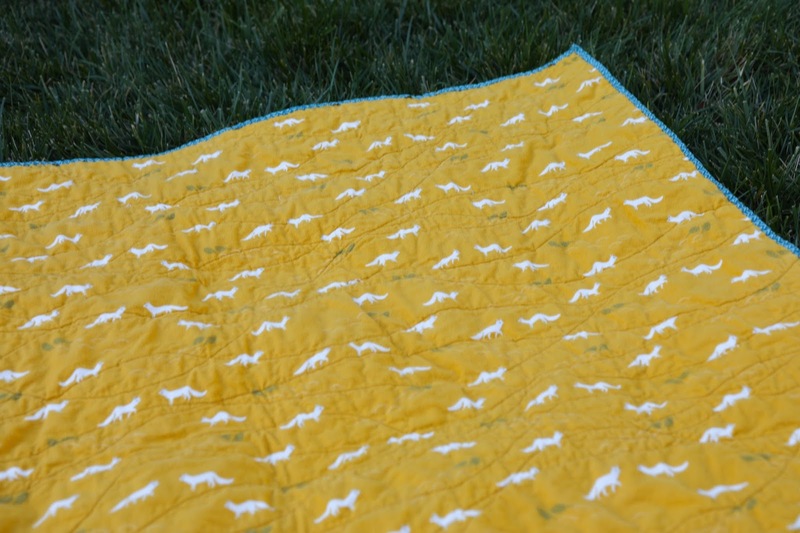 I just sewed wavy, intersecting lines, across the quilt, without much of a plan, until I was happy with how it looked. There are a few lines that are not as smooth as I would have ideally preferred, and one or two tiny puckers on the back, but nothing that warranted unpicking. Although this quilting, like all quilting, gave me a back and shoulder ache, I was able to quilt the entire thing in an afternoon. I will definitely be revisiting organic wavy line quilting for future quilts! I dropped off the banner and quilt with the new family last night, and was delighted that the quilt matches the artwork they just ordered for the nursery. And baby, while TINY, is strong and doing well! 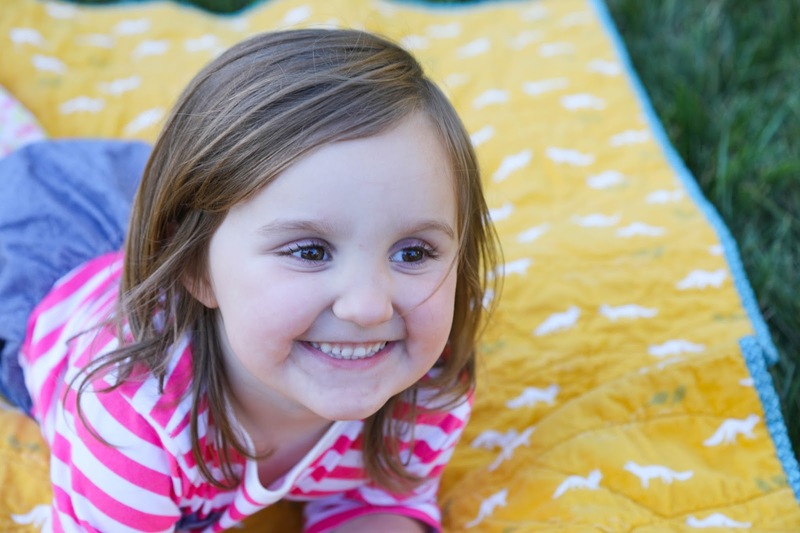 I will leave you with some cute photos I took of Maggie on the quilt. She is just so exuberant! So full of life. Those are beautiful, loving gifts, and I am sure they will be deeply cherished. (Your stash must be incredible, if this is a sampling of it.) And Maggie! What a dear little girl. What lovely gifts. I hope your friend and her family have seen the last of their bad luck. Aw that's lovely Inder. It's funny to think that come the apocalypse, our sewing super powers may actually be some use after all. 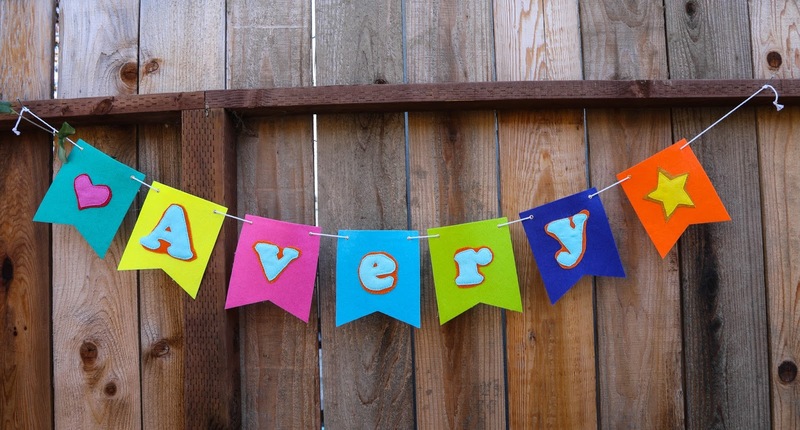 I like the puffy double thick felt letters too.